A Dedicated IP is a server address that uses the default port for Minecraft. The default port varies between the edition of Minecraft you have. Because the Dedicated IP lets your server run on the default port, your IP automatically points to the port assigned to your server. 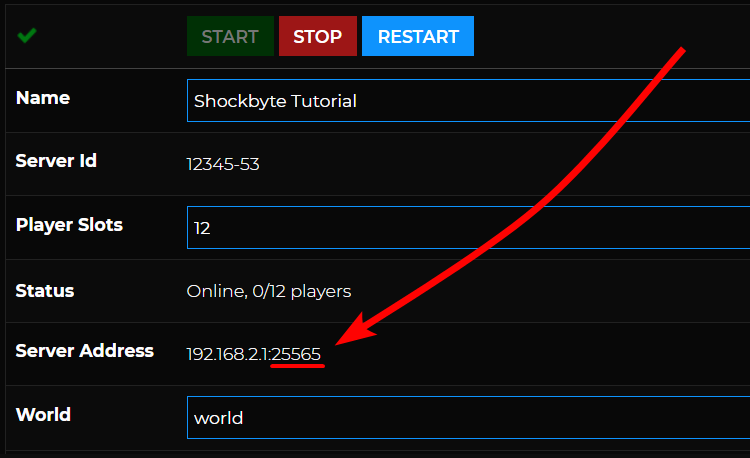 This means that if your full server address is 192.168.2.1:25565, you can join your server just by using the IP which 192.168.2.1 without the port. The same goes when using a custom domain/subdomain. Instead of mydomain.com:25565, you will only need to use mydomain.com. How can I get a Dedicated IP for my server? In order to get the default Minecraft port (25565 or 19132) you need to purchase a Dedicated IP addon for your server. On your Shockbyte client area, navigate to Services > View Available Addons. On the Product Addons page, under the Dedicated IP section, select the server that you would like to order a Dedicated IP for. Be sure to select the correct server if you have multiple servers. Then click the Order Now button. Once you've verified your order, click Checkout. You can then pay using your preferred payment method and complete your order. Once you've successfully ordered and paid for your dedicated IP, send us a ticket requesting to have your dedicated IP assigned for your server. If you have any inquiries or concerns about your Dedicated IP addon, let us know by sending us a ticket.